All De Anza League football. If you are a coach or an athletic director who has all-league teams for any fall sport for an area league, please email them to pete.marshall@langnews.com. OK, here we go, as all the remaining football leagues in the area start league play this week. I will revisit my predictions in all the leagues. I predicted at the beginning of the season, and revising my predictions from what I know after 5 games. 1. Ontario Chrisitan, 2. Aquinas, 3. LInfield Christian, 4. Calvary Murrieta, 5. Western Christian, 6. Arrowhead Christian. 1. Ontario Christian, 2. Western Christian, 3. Arrowhead Christian, 4. LInfield Christian, 5. Aquinas, 6. Calvary Murrieta. Why the change: Western and ACA are better than expected, both at 5-0, but I don’t think they can knock off the experience of Ontario Christian. Offensive MVP: James Toland, Shadow Hills, Sr. Defensive MVP: Lucas Jenkins, Big Bear, Sr.
Special Teams MVP: Nate McClain, 29 Palms, Sr.
Lane Dowty, Big Bear, Sr.
Taylan Seaman, Big Bear, Jr.
John Hawkins, Big Bear, Sr.
Tyler Babbit, Big Bear, Sr.
Lance Hubbard, Big Bear, Sr.
Tre Prudhomme, Big Bear, Jr.
Morgan Cole, 29 Palms, Sr.
Talo Wilson, 29 Palms, Jr.
David Failfitu, 29 Palms, Jr.
Marcus Chesnut, 29 Palms, Sr.
David Haney, 29 Palms, Jr.
Jake Culver, 29 Palms, Jr.
Hiram Rodriguez, Shadow Hills, Jr.
Rene Herrera, Shadow Hills, Sr.
Orlando Oretega, Shadow Hills, So. 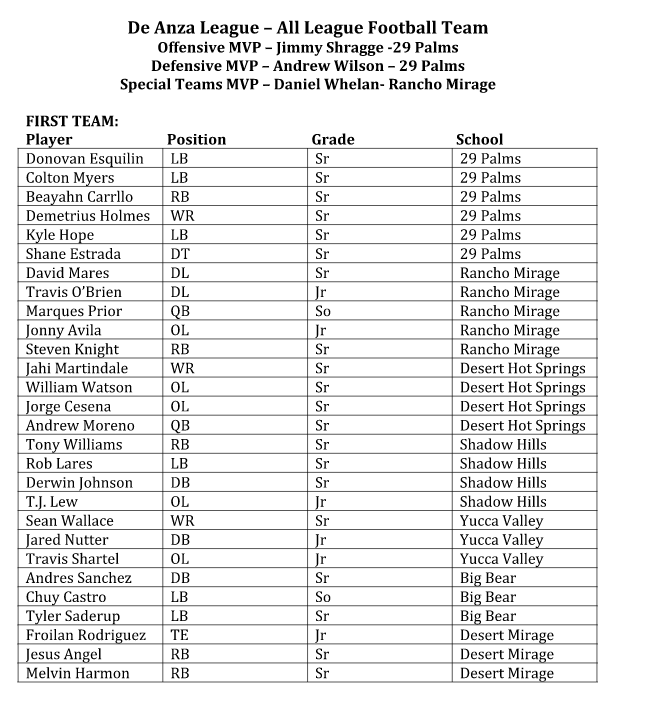 Moises Contreras, Shadow Hills, Sr.
Brian McGowan, Yucca Valley, Sr.
Ben Hetz, Yucca Valley, Sr.
Logan Vallo, Yucca Valley, Jr.
Joey Rutherford, Yucca Valley, Jr.
Steven Steed, Desert Hot Springs, Jr. Ace Lewis, Desert Hot Springs, Sr.
Nick Martinez, Desert Hot Springs, Sr.
Damian Gutierrez, Desert Mirage, Sr.
Alex Navarro, Desert Mirage, Sr.